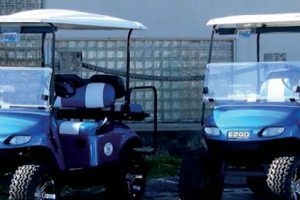 Marty Graham (September 28, 2017) — The San Diego Association of Governments has noticed a big increase throughout the county in the use of golf carts and low-speed vehicles — golf carts being two-seaters and LSVs, as they’re called, being four-seaters. So, a group of traffic engineers from throughout the county looked at LSVs (often called NEVs, for “neighborhood electric vehicles”) on September 21 and saw a lot of potential for use of electric carts in transportation, according to City of Carlsbad traffic engineer Doug Bilse. “We have a lot of questions about using them on the streets, and we learned that local jurisdictions need to take action to allow people to use these vehicles on the roads,” Bilse said. Traffic engineers are starting to think of the way future roads will be designed, especially with the effort to reduce greenhouse gases. Regional traffic engineers are starting to look at how to include low-speed vehicles in street design, since they expect that self-driving vehicles will be built on low-speed vehicle platforms, Bilse said. 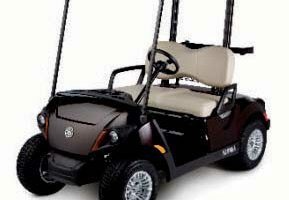 Both golf carts and low-speed vehicles are restricted to streets where traffic speed tops out at 25 mph for golf carts and 35 mph for low-speed vehicles. They have to be registered with the Department of Motor Vehicles — street legal — if they’re running around on the roads, and different municipalities have their own laws about where they can and can’t go. Drivers have to be licensed and insured. But different cities have different rules for golf carts. Some, like Rancho Bernardo, restrict the use of carts to around golf courses. Others, like Coronado, treat the carts like any other vehicle as long as they’re on speed-appropriate streets. 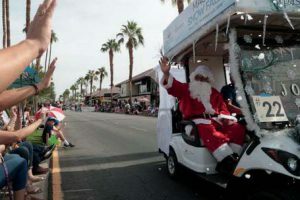 “We don’t have any problems with people using golf carts,” a Coronado police sergeant said. Luke Matheny of Sundance Golf Cars does the mechanical work and refurbishing of carts at the company’s La Mesa shop. Sundance rents the carts to people in Coronado and sells them to customers who live in Pacific Beach, Coronado, and La Jolla. They’re really popular in Newport Beach and Laguna Beach, he said. Sundance is working on getting into the low-speed vehicle business. “They’re going to be important,” Matheny expects.